Takaaki Kajita of Japan and Arthur McDonald of Canada won the Nobel Prize in physics on Tuesday for discovering the "chameleon-like" nature of neutrinos, work that yielded the crucial insight that the tiny particles have mass. The Royal Swedish Academy of Sciences said the two researchers had made key contributions to experiments showing that neutrinos change identities as they whiz through the universe at nearly the speed of light. Neutrinos are miniscule particles created in nuclear reactions, such as in the sun and the stars, or in nuclear power plants. There are three kinds of neutrinos and the laureates showed they oscillate from one kind to another, dispelling the long-held notion that they were massless. The winners will split the 8 million Swedish kronor (about $960,000) prize money. Each winner also gets a diploma and a gold medal at the prize ceremony on Dec 10. Kajita and McDonald made their discoveries while working at the Super-Kamiokande detector in Japan and Sudbury Neutrino Observatory in Canada, respectively. Kajita showed in 1998 that neutrinos captured at the detector underwent a metamorphosis in the atmosphere, the academy said. 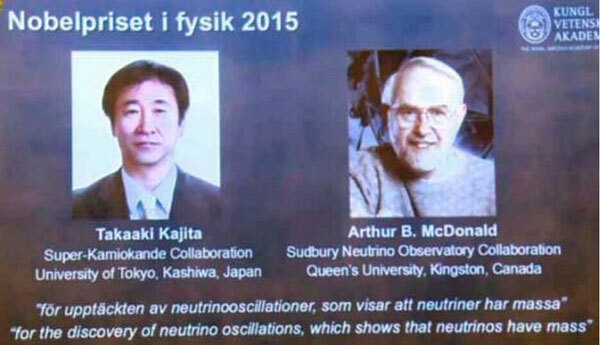 Three years later McDonald found that neutrinos coming from the sun also switched identities. McDonald told a news conference in Stockholm by telephone that the eureka moment was when it became clear that his experiment had proven with great accuracy that neutrinos changed from one type to another in traveling from the sun to Earth. Asked how he felt when he realized on Tuesday that his work was suddenly going to receive the world's focus, McDonald said, "It's a very daunting experience, needless to say." McDonald said that scientists would still like to know what the actual mass of the neutrino is. And experiments are looking at whether there are other types of neutrinos beyond the three clearly observed. On Monday the Nobel Prize in medicine went to scientists from Japan, the US and China who discovered drugs that are now used to fight malaria and other tropical diseases.